Finally, a boat name request with some teeth. Kudos to this boat owner for giving us something to work with. Now, get your creative juices flowing, and find this big family a boat name for their big new boat! Comment below with your boat name suggestions. 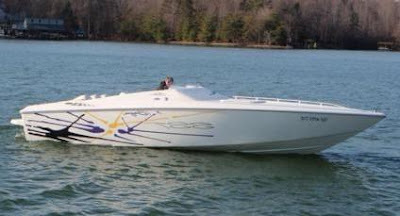 We had a 23 foot boat before and we are so happy to have finally purchased a 27 foot Baja. We love to boat and hang out with friends on the lake. It's what we love to do All Summer Long. How about "All Summer Long"? I noticed you capitalized those words, so maybe it was meant to be. Thanks for your input. We'll post your boat name idea or comment as soon as we can after we verify it's not spam. Suggest some boat names and WIN! How to help: Read the boat name stories on this site, then suggest boat names by adding a comment after any post. How to win: Non-anonymous users who suggest boat names will be eligible for a random drawing of a personalized boat name t-shirt from BoatNameGear.com each month. Is it ok to name a kayak? This site was created to help people name their boats. Travel theme. Theme images by piskunov. Powered by Blogger.